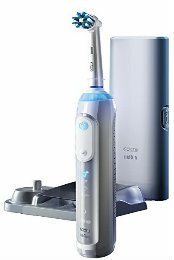 Oral-B Pro 6000 is one of Braun's higher-end electric toothbrushes that comes with an interactive app. As most, high-end models, this one does not come cheap. 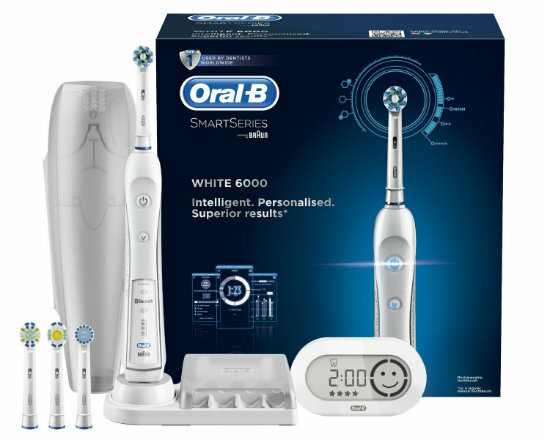 The Oral-B Pro 6000 SmartSeries Electric Toothbrush is a fully realized product that contains everything one might need in an electric toothbrush of the twenty-first century. Inside the box, you will find the motorized toothbrush itself, which is, of course, a quite important component. The 6000 model comes with a thick handle loaded with electronic devices and a slim brush head that is replaceable. Much like any toothbrush head should be. This is not the smallest electric toothbrush that money can buy. Having said that, it is rather bulky. It will take some time getting used to holding it. It is 4.5cm thick and the width we measured is 3cm. In terms of height, it is pretty standard – 20.5cm without the brush head being attached. This is where most Oral-B and Philips models generally measure up. Once you attach the brush head, you are looking at 24cm. Still, pretty standard. 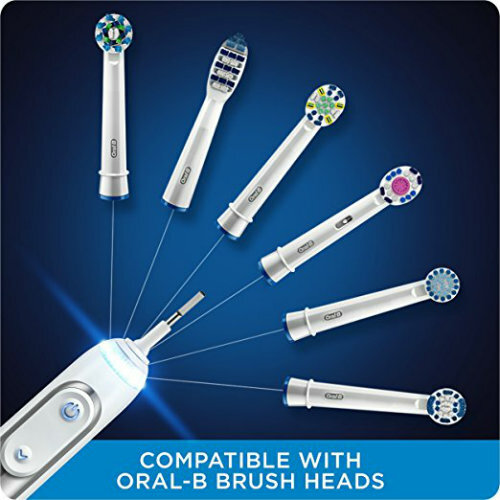 Weighing 168 grams with the brush head attached, the 6000 is a bit heavier when compared to other Oral-B models, such as the 5000. This shouldn’t scare you though because you get better battery life. The design is pretty standard, right down to the circular brush head and easily gripped handle. That is if you have large hands. This model could feel awkward in the hands of a child, or an adult with smaller palms. Much like other Braun produced electric brushes, the power button is large and situated at the front of the device. The smaller button placed underneath is your settings mode button. It allows you to quickly change the brushing modes. A cool blue color illuminates each button, giving the Pro 6000 a cool and sophisticated look. Older Braun models do have the same feature, but it used to illuminate in green. I think blue is a much better choice. One simple push of the settings button, allows you to navigate within the 5 brushing modes. It is a rotatory button, which means that the options will just keep rotating as long as you push the button. This is pretty standard for electric toothbrushes, as manufacturers are trying to avoid stuffing their devices with too many buttons. The buttons are easy to navigate if you are not looking down, as they stick out of the handle a little bit. Since there are only two, and they are of different size, you get used to them rather quickly. Sooner or later, you will be able to recognize the brushing modes without looking at the screen as well. The Bluetooth and Wireless SmartGuide indicators are located at the bottom front end of the Pro 6000. They are easy to spot, and when illuminated in blue, look pretty cool. There is also a battery status indicator. When turning on the brush, the indicator will stay lit (in blue) for approximately 15 seconds. This is enough time for you to acknowledge how much battery life is left in the brush. Speaking of colors and illumination, at the top of the device there is a smoked plastic which is used as a warning signal. Unlike the rest of the Pro 6000, this part illuminates in red in order to notify the user if he or she are brushing too hard. Its second function is to blink in green, in order to remind the user to move from one part of the mouth to another (QuadPacer feature). The Pro 6000 only comes in a single titanium white color with a hint of neon. But, is not the most boring thing one could put in their bathroom. If I open my wife’s bathroom cabinet, I can find at least 10 unnecessary, boring and over-priced items that do not belong there. See, this toothbrush at least comes with the Oral-B app which allows users to choose from 12 different colors to dictate what color the lights of the brush are. So, you can choose to illuminate your bathroom in a variety of colors. The device comes with a single toothbrush head. Even though I find this to be annoying, and cheap on behalf of Braun, I guess we should be grateful that the brush heads are interchangeable. In other words, you can practically use this model with any other brush head available by Oral-B. You will have to, of course, purchase them. However, they are readily available in a variety of superstores and convenient stores around the country. Do not attempt to mount non-Oral-B brush heads. Also, don’t be cheap and don’t buy off-market brush heads. 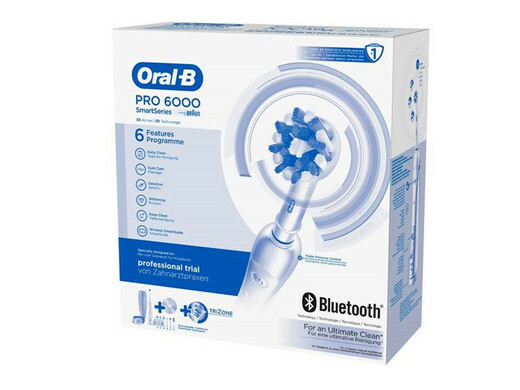 The Pro 6000 also includes a charging station and a carrying case that can be used to mount a smartphone for easy viewing while brushing your teeth. This is necessary in case you decide to use the interactive app. You will have to align the camera of your smartphone with your mouth. This is done so the app can better track the movements of your toothbrush, and later on, provide you with some information and statistics on your brushing habits. The app is free and it is available for iPhone and Android users. Though it can seem bizarre to need specialized instructions or programming to brush your teeth, the Oral-B app, allows you to create a customized brushing routine with specific goals in mind, such as improving gum health or purging plaque. At Dental Dorks we have mixed feelings about the usability and necessity of such apps. For the sake of not taking this review in a completely different direction, I will remain neutral on the topic. The travel case is the same titanium white color with a smooth texture as the brush’s handle. Considering the cost of the investment to get this toothbrush, something to protect it during travel or moving is definitely a step in the right direction. 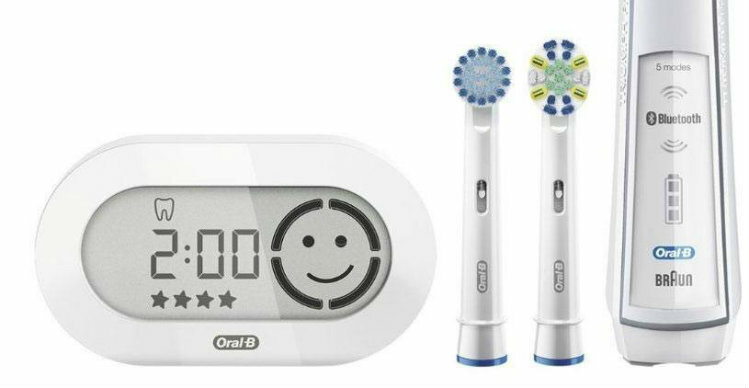 The battery life for this toothbrush can manage up to 12 hours of constant use before running out. While this may be a noticeably exaggerated number that does not take into account the factors of actual oral hygiene, the fact is that as long as one is charging the brush between uses, they shouldn’t have very many problems with battery life. Unless, of course, you are brushing near constantly, which is a pretty bad idea as there can definitely be such a thing as too much of a good thing. Running on a lithium-ion battery, the battery is rechargeable and doesn’t need a cord. 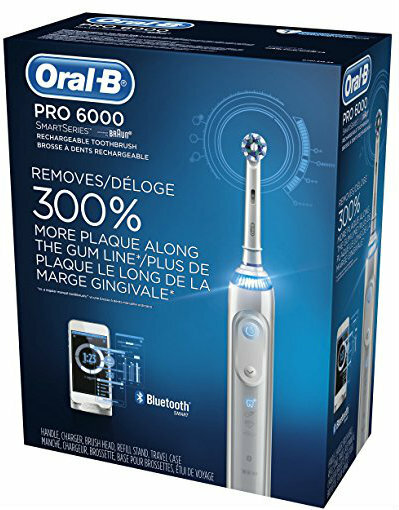 By the way, this is one of very few Oral-B models that uses a Lithium-Ion battery. Most other models are stuck in the Stone Age with NiMH batteries. This is why the Pro 6000 has a better battery life than most competing brands out there. Most of this toothbrush’s features are among the higher end in their class. 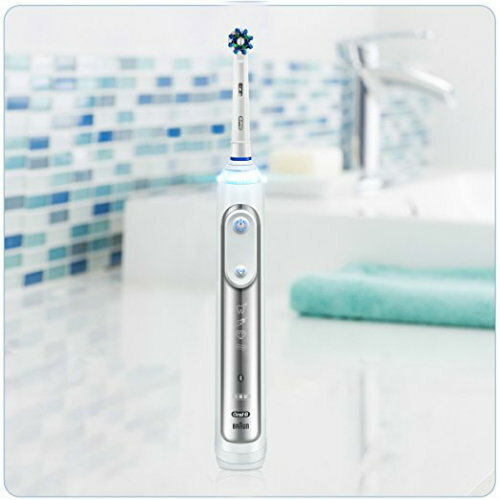 The device features an easy start system that works pretty well with the free Oral-B app. There are a number of attributes to help users get the most out of their toothbrush and their oral hygiene routine in general. A QuadPacer tracks the speed and pressure of the toothbrush against the teeth and gums. Though this sounds a little odd to some people, this does allow users to know when they’re pressing too hard (which can wreak havoc with gums and if done too often, the enamel of the teeth themselves) or when they’re lingering too long on a particular area, which can also be bad. There is also a SmarTimer, which has lately become a standard feature on all electric toothbrushes. This is a mode that automatically turns the brush off after 2 minutes of use. If you play around with the settings, you can change the duration to whatever amount you see fit for your personal use. But, do keep in mind that 2-minute brushings are recommended by dental professionals around the world. There are five different cleaning modes intended to give a specific type of cleaning to the user’s teeth. There is the Daily Clean which is the typical twice a day brushing people need. It’s not amazing, but it is reliable. Gum Care mode is intended for people who need to do something about their mouth’s problems with gum disease, particularly gingivitis. Sensitive mode is intended for people with sensitive teeth, whether through genetics, bad luck or regrettable choices with dental care in the past. Whitening is intended to help those users who really want whiter teeth and does seem to work as long as one is also using the right toothpaste and keeping up with their oral hygiene routine. Finally, there is a Pro-Clean mode, which is something of a customizable mode that can be programmed in based on a dentist’s directions. To be honest, it is my experience that despite the number of modes, people usually end up using just one mode over and over again. This is not to say that people are boring, but most people are often not capable of telling the difference between the modes in terms of plaque removal. And, if you cannot tell if the results are better with the Pro-Clean mode VS the Daily Clean mode, you might as well just stick to the latter. Overall, the toothbrush tests pretty well. Though the smartphone functionality is unnecessary in many cases, it does seem to add a bit of a video game feel to brushing your teeth, which is always a good thing for people who find themselves bored while cleaning their teeth. The system’s various modes and functions seem to work great and do everything for the user’s teeth that they promise. Teeth are cleaner, breath smells better and gum disease is kept at bay. The whitening mode can’t do its job on its own though. Conversely, those with problems with their gums will find that the pressure sensors have helped them beat gum disease and heal previous damage to their gums. As for actually brushing one’s teeth with this toothbrush? It feels pretty calm, quiet and with minimal intrusiveness into one’s mouth. An adaptable toothbrush that can be modified to fit any user’s oral hygiene issues. Long battery life that can easily handle any reasonable brushing length. Really and truly does clean teeth amazingly well. Brush heads are pretty easily replaceable. Advanced electronics make the price exponentially higher than a typical drugstore toothbrush. Wireless connectivity may not be needed for every user and some users may want a less advanced toothbrush if they have no use for wireless connectivity. Handle thickness is not perfect for all users, but this isn’t very noticeable. If you are not sure about this model, check out our top comparison list here. Maybe you will find something more relevant to your needs. On the handle of the 6000 there are pictures of a tooth, a feather, a diamond and a wave….what do these mean?